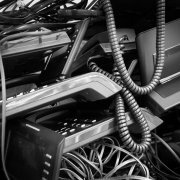 This year will see big changes when it comes to Waste Electrical and Electronic Equipment (WEEE) waste removal. The tightening regulations in the recycling of equipment such as computers, laptops, tablets, mobile phones, printers, fans, kettles, and lamps – all the sorts of things we see in virtually every workplace – will mean that the UK’s WEEE collection targets will rise. The target for 2019 will be the collection of 65% of the electrical and electronic equipment placed on the market or 85% of the WEEE generated. This comes after WEEE waste removal targets for 2017 were missed by 99,132 tonnes. The 2017 amount was also 58,514 tonnes fewer than the e-waste collected in 2016. 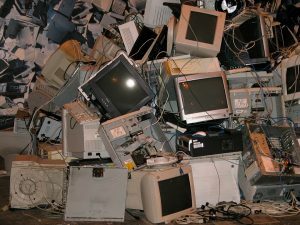 Compare this with the estimated two million items of e-waste discarded by businesses and homes in the UK every year, and you begin to see the problem. The government aims to move toward a circular economy for e-waste where as much is recycled as possible. It can’t do that when only a fraction of e-waste is collected and recycled. So, targets are getting more stringent and businesses have to live up to their duties to the public and the environment. 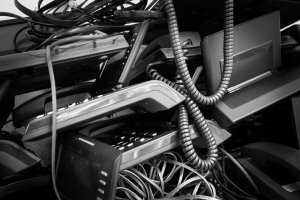 What are the rules surrounding WEEE waste removal? The government has provided useful advice for businesses on how to identify and categorise WEEE products here. Producers and distributors of electronics and electrical equipment each have separate sets of responsibilities. Producers must register annually, ensure the right BSI label is on the product, and make sure information on the recycling of its components is made easily available. Distributors must accept e-waste for free from customers buying like-for-like products, whether this is done in-store or online. Distributors must be in a take-back scheme and provide customers with information on recycling. It must also report on whether the waste is household or non-household. What are the potential consequences for non-compliance? This can be costly for businesses. In 2014, a mobile phone logistics firm which failed to register with a compliance scheme, and faced six other charges, was fined £23,000. In 2015, an online trader was fined more than £45,000 for failing to comply with environmental legislation for batteries, electrical equipment, and packaging. 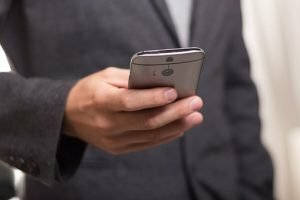 How do I choose the right waste management company for my e-waste? Pick a company with a track record in successful WEEE waste removal, such as Inspire Waste Management. They will understand the WEEE regulations and the different categories within e-waste and will carry out disposal correctly. Do you need advice on WEEE waste from our Inspire Waste Management team? Contact us on 0800 002 9282.
https://inspirewaste.co.uk/wp-content/uploads/2019/01/INSPIRE1phone-3823126_960_720.jpg 640 960 Inspire-admin https://inspirewaste.co.uk/wp-content/uploads/2018/10/inspire-c-waste-e1540324531728.png Inspire-admin2019-01-04 17:19:112019-01-04 17:19:11Is your business ready for 2019’s new WEEE waste removal targets?